Summer/Fall-2019 Projected Occupancy! NEW CONSTRUCTION! STILL TIME MAKE DECORATIVE SELECTIONS! 3-Bed + Large Den/Loft & 3 & 1/2 Bath Carriage Home. Private 1st Floor Garden Patio. 2nd flr. 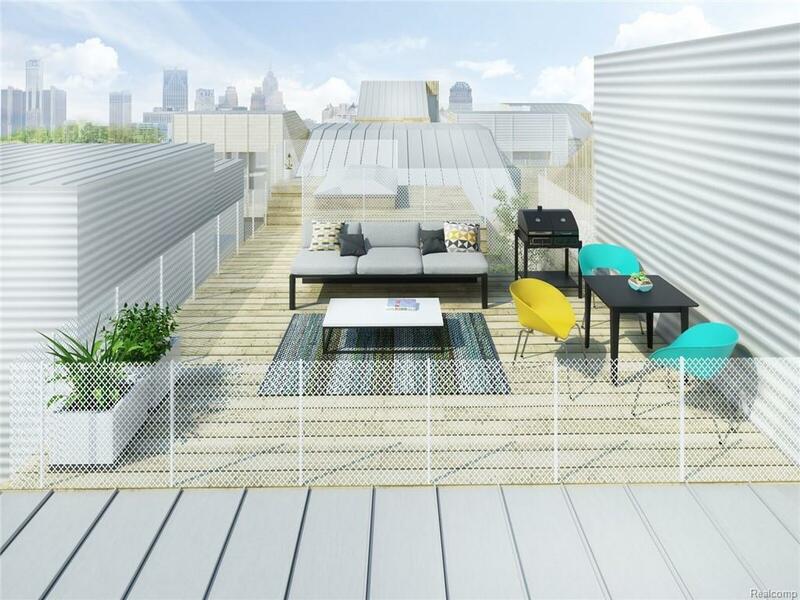 Balcony off Owners Suite & a Private ROOFTOP TERRACE! Living/Kitchen/Dining on 1st Flr. All Bedrooms & Loft on 2nd/3rd Floors. Located in Brush Park's premier City Modern. 2-Blocks East of: Q-line/Little Caesar's arena. Walk to Comerica Park, Ford Field & dozens of Restaurants/Retail along Woodward. 1-Car attached Garage. No one lives above or below you! Kitchen w/full overlay 42" Cabinets, Hood-fan, Gas SS Range, SS DW & SS Micro in Island w/snack-bar overhang! Soft Close Doors/Drawers/hardware & all Quartz Countertops. Hardwood in Kitchen/Dining/Living/Loft. Hardwood Staircase treads/painted risers. All bedrooms w/private Full Baths w/12x24 tile & Quartz Countertops. Laundry on 2nd level. 9' Ceilings, Huge Windows, Studio Ceiling detail on 2nd flr. Mews/Park in Center of Neighborhood. NEZ tax zone! Listing courtesy of Kensington Real Estate.